On August 15, 1947, the United Kingdom granted independence to British India, dividing it between largely Hindu India and largely Muslim Pakistan. Gandhi, who opposed the partition, spent the day, celebrated as Indian Independence Day, fasting to try to end the deadly violence between Hindus and Muslims precipitated by the partition. On January 30, 1948, a Hindu nationalist fatally shot Gandhi at close range in the garden of a large house where he was staying. The assassin claimed that Gandhi’s tolerance of India’s Muslims was the primary cause of the sectarian violence, which left about 500,000 dead. The next day, Gandhi’s body was carried on a modified gun carrier from where he died to Raj Ghat, a traditional cremation area five miles away along the sacred Yamuna River. Two million grieving Indians of all religious traditions joined the funeral procession. 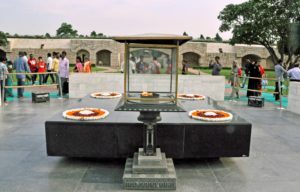 Gandhi’s body was cremated on January 31, 1948, and his ashes placed in urns that have found their way around the world.